After the Flood, photographers flocked to Johnstown. It was the biggest story since the assassination of President Lincoln in 1865. And it was definitely a story that had to be seen to be believed! Photography in 1889 required much different equipment than it does today. Negatives (film) were glass, which was heavy and easily broken. Cameras also weighed a lot and had be used on tripods to keep them still while the picture was being taken. Imagine hauling all this equipment over mud, pools of water, and giant piles of wreckage left by the Flood! The pictures these adventurous photographers recorded are truly amazing! Because of them, thousands of photographs of the effects of the Flood have survived to help us imagine the horrible devastation the Flood caused. Since photographs were very expensive to print in newspapers and books, artists sometimes made engravings of the photographs for newspapers and magazines. Some photographers took stereoviews with special cameras with two lenses. Customers bought the stereoviews in collections that they viewed with a gadget called a stereopticon. The town of South Fork after the Flood passed through. 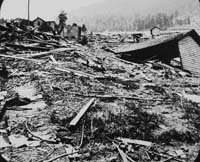 250 houses were wiped out in the town of Woodvale. This bridge was one of the few things left standing in Woodvale. 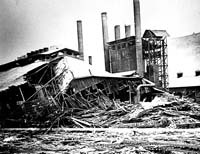 Cambria Iron and Steel office, in the background, survived the flood. 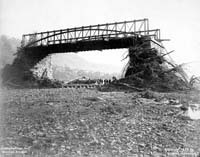 Wreckage from the 1889 Flood. 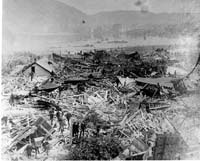 Wreckage from the 1889 Flood. The Franklin St Methodist Church in the background survived the flood and protected buildings behind it. 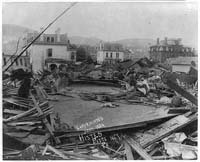 Main Street in Johnstown after the 1889 Flood.